Chicago boasts a large number of tourist attractions, but there is undoubtedly a select handful that is by far the most popular with visitors. 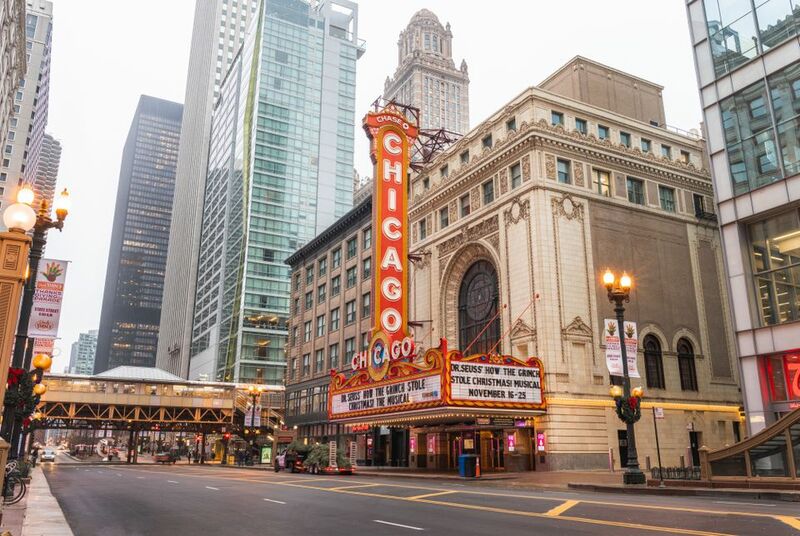 Located on Lake Michigan in Illinois, Chicago ranks with New York City and Las Angeles as cities that draw visitors for the U.S. and internationally. People come to see it's bold architecture and skyscrapers such as the John Hancock Center, the Willis Tower (formerly the Sears Tower), and the neo-Gothic Tribune Tower. Chicago is known for its skyline, the museums, and the parks. Here are some of the most significant tourist destinations in the Windy City, which range from Lincoln Park Zoo to President Obama's Hyde Park home. Opened May 26, 1927, the Buckingham Fountain in Grant Park is one of Chicago's most recognizable landmarks, and its hourly water show in the summer is fun for young and old. The fountain, constructed out of gorgeous pink Georgia marble, was donated to the city by Kate Buckingham, a grand patroness of the arts. It is Chicago's centerpiece along the Lake Michigan shore. While beautiful, the real attraction of the fountain is the computer-controlled water, light, and music show that takes place every hour. It's a dazzling display that makes for a fantastic photo opportunity and a picture perfect background—which is why you'll inevitably see a wedding party having portraits taken there during milder weather. The 360 Chicago Observation Deck (formerly John Hancock Observatory) may not be as high as the Willis Tower Skydeck, but at 1,000 feet up, the view of Chicago is still breathtaking. The observation deck located in the historic John Hancock Building is the place to go for breathtaking 360-degree views of Lake Michigan and the city. If that isn't enough, they offer "Chicago's highest thrill ride," an enclosed moving platform the will tilt you over the streets below from the 94th floor. After the scenic thrills, enjoy a cocktail at the Signature Room on the 95th floor. Nestled among lagoons and mature trees, Lincoln Park Zoo is one of the most beautiful in the country, featuring historical architecture and world-class wildlife exhibits. It's easy to spend an entire day at this tranquil, intimate destination and forget that the bustling city of Chicago is right beyond its boundaries. Open 365 days a year with free admission to all, the Lincoln Park Zoo is a premier Chicago attraction. Millennium Park is one of the highlights of the city and rivals the Lincoln Park Zoo as Chicago's best free attraction. The Bean (a sculpture officially known as Cloud Gate) is quickly on its way to becoming Chicago's most recognizable icon. It is located on the east side of downtown, bordered on the west by Michigan Avenue, on the east by Columbus Drive, on the north by Randolph Street, and on the south by Monroe Street. Primary Chicago public transportation to the park is either the Michigan Avenue CTA bus #151 or the Red Line subway train, Randolph stop. Admission to Millennium Park is free and is open daily from 6 a.m. to 11 p.m. Originally a shipping and recreational facility, Navy Pier has a rich history and has evolved into one of the most popular spots for people visiting Chicago. Navy Pier is separated into these areas: Gateway Park, Family Pavilion, South Arcade, Navy Pier Park, and Festival Hall. One of the fun areas of Navy Pier to take kids to is the Family Pavilion, home to the 50,000-square-foot Chicago Children's Museum, an IMAX Theater, the Crystal Gardens indoor botanical park and numerous restaurants and shops. In another section, you can catch harbor cruises. Navy Pier and its park is the place to go for summer concerts, rides, and a miniature golf course. The Obamas' home address is 5046 S. Greenwood Ave., and it's located in Hyde Park on the South Side. It's also about a five-minute drive to the Museum of Science and Industry. The former president's home is in a lovely historic neighborhood. You can visit Burnham Park where the Obama family often walked. The park greenery starts just South of Grant Park and is best known for its beautiful harbor and skateboarding park. Also in the park is Promontory Point, a peninsula designed by landscape architect Alfred Caldwell, where you can get some amazing views of the Chicago skyline. With almost two million visitors a year, the Shedd Aquarium easily qualifies as one of Chicago's most popular attractions. And rightly so—it's one of the premier aquariums in the country. A word to the wise: Get there early, or you may be greeted with a long line snaking out the door and all the way down the aquarium's steps. Shedd Aquarium is part of Chicago's Museum Campus. Soaring at 110 stories tall, the Willis Tower (formerly the Sears Tower) is the tallest building in North America and remains a huge tourist attraction, namely due to the Sears Tower Skydeck observatory offering a view of Chicago at 1,353 feet (412 meters). On the 103rd floor, you'll be awed by the views extending to four states as you stand in clear observation boxes which include the scary "Ledge." Those who are not afraid of heights can step outside (while in the observation box) and look down. The Ledge’s glass boxes extend out 4.3 feet from the Skydeck. Games at Wrigley Field, home of the Chicago Cubs, consistently sell out. Fans and tourists come to soak in the history of the United States' second oldest ballpark and enjoy the party atmosphere of the crowd, especially in the bleacher seats. The famous Field Museum is a natural history museum in the Grant Park's Museum Campus. Popular things to see include the Inside Ancient Egypt exhibit, where you can go into a reconstruction of a three-story Egyptian tomb. Kids always want to visit SUE, the museum's T. rex, the largest, most complete T. rex fossil ever unearthed. You can take a bus tour to visit the speakeasies that made Chicago infamous during Prohibition. The guided tours tell stories of gangsters, politicians, and illegal alcohol. You're on your own to purchase drinks so can choose not to indulge. Enjoy dinner at Tommy Gun's Garage with a gangster and flapper show in a Prohibition-era speakeasy-type theater. This musical comedy is a fun event where diners get involved and may even be subjected to a raid. The dinner and show price includes the main entree, soup or salad, vegetable side, potato, dessert, coffee, tea or soda. Cocktails (also called "hooch"), which can be purchased, include such delights as "Al Jolson's Razzmatazz" and "Charlie Chaplain's Chocolate Martini." Take a Shoreline Architecture River Cruise from Navy Pier. Chicago’s architecture is world-famous. On this cruise, you'll see the Chicago skyline, and have over 40 architectural landmarks pointed out to you as you travel along the Chicago River. Chicago's architecture is part of the history of this large city and you'll hear the story of how it all unfolded. Included in the tour is seeing skyscrapers like the Tribune Tower, Wrigley Building, Trump Tower, Marina City, and more. At Adler Planetarium, America's first when built in 1930, you'll learn about the Universe through displays, events, and shows. In "Mission Moon," find out how the United States became the first nation to put a man on the Moon and at the "Historic Atwood Sphere," you can experience the night sky over Chicago as it was in 1913. See the Adler sky shows and learn about the planets, the stars, and our moon. There are special programs that enhance learning for little children. The Hop On Hop Off Big Bus Chicago 1-Day Classic tour is a great way to get oriented to the city when you arrive. The tour will take you by the famous skyscrapers and down the Magnificent Mile. You can get off the bus at any stop to explore more in-depth. As you ride, learn from the narration which tells you about the architecture, landmarks, and history. Buildings such as the 360 Chicago Observation Deck, Willis Tower, and the Wrigley Building are stops along with the Shedd Aquarium, Field Museum, Millennium Park, and more. On Navy Pier which extends out into Lake Michigan at the mouth of the Chicago River, there is a huge Ferris wheel, visible from afar as part of the Chicago skyline. From the enclosed gondolas on the wheel, you'll reach heights of 200 feet and marvel at the 360-degree views of Chicago and Lake Michigan. The pier is also home to some other fun rides, the Children’s Museum, Chicago Shakespeare Theater, weekly fireworks displays, restaurants, live concerts, and more. The Magnificent Mile is the part of Michigan Avenue that goes from the river at the south end to Oak Street at the north end. It's a great place to go shopping and out to eat. Along the walk, you'll pass the Tribune Tower, the Wrigley Building, and the 100-story John Hancock Center, with a rooftop observation deck with a restaurant. There's history too: See the original Water Tower and Pumping Station, two survivors of the Chicago Fire of 1871. These ornate structures are worth a visit. Visit the Art Institute of Chicago, in Grant Park, which houses a permanent collection of more than 300,000 works of art from all over the world. The institute, founded in 1879, is one of the oldest art museums in the United States. There are contemporary works such as Andy Warhol's print of actress Elizabeth Taylor. But the museum also houses a Medieval armory on the second floor where you'll see swords, crossbows, and suits of armor. The Museum of Science and Industry is in Hyde Park and is worth seeing; it's not only a part of Chicago history, but its collections are also fascinating. The museum was initially part of the Columbian Exposition of 1893. As you visit the museum, you'll encounter Colleen Moore’s Fairy Tale dollhouse made out of gems, tour a real German submarine highlighting WWII history, and learn about flight while riding in aircraft simulators. The 606 is an urban hiking and biking trail modeled after New York's High Line trail. It's a great way to visit some of the Chicago neighborhoods and get some exercise. The 2.7-mile trail is an elevated path along an old railway line that was no longer in use. There are 12 access points to the trail which runs along the Bloomingdale Trail (map). You'll discover neighborhood restaurants, shops, and pubs along the way where you can take a break.